GoPro has almost become a genericized trademark for “sports actions camera”, but it really shouldn’t be. From Chinese maker Yi Technology comes the Yi 4K+. It’s is a lot cheaper than its GoPro equivalent – the Hero Black 6 – and a lot better than the next cheapest model, the Hero 5. So why pay more? 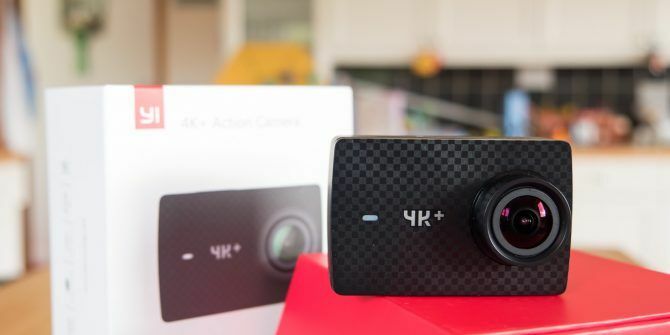 Our review was filmed almost exclusively on the Yi4K+ itself, so be sure to check that out and ramp up the YouTube quality setting as high as it’ll go. If you spend any amount of time on Amazon researching products, you’ll invariably come across the white label devices that are rebranded. They all look startlingly similar – as if the logo was the only thing differentiating them – and fall into the extreme budget end of price ranges. There’s a very good reason for this: they are basically all the same device. One manufacturer bulk produces a low quality, ultra budget device, then other companies come and slap their brand on it and take care of the marketing. Generally, you should steer clear of action cams like this, unless you really do just want a throwaway device with terrible picture quality. At this end of the spectrum, you get what you pay for. This isn’t true across all device types – a USB3 hub or cable adapter does its job regardless of brand has been slapped on it – but is generally true of cameras. Yi Technology is backed by Xiaomi, China’s largest smartphone manufacturer, so you can be relatively sure that it’s not going away anytime soon, and that they have the expertise to manufacture their own superb products. EIS up to 4K30fps, or standard up to 4K60FPS; down to 720p@240fps. The box is somewhat sparse: you’ll find a USB-C charging and data cable (though no wall adapter), and a USB-C to stereo mic adaptor, allowing you to use an external mic as input. You’ll need to purchase at the very least a U3 class microSD card (class 10 is not fast enough). Like the Yi4K, there is no waterproofing. For that, you’ll need a case. The battery is removable, so you can buy spares if you wish (one is of course included, too). From a design perspective, very little else has changed. The front of the device now features a carbon-fibre print, but otherwise the shape is the same so your existing cases and accessories will all fit. While on paper the Yi 4K+ seems like an incremental upgrade (as indicated by the simple addition of a + to the name of the previous model), when you’re dealing with 4K footage, every little quality jump helps. The first and most significant update is that the frame rate has doubled. The Yi 4K was already one of the cheapest ways of recording great quality wide-angle 4K footage at 30 frames a second. The 4K+ model allows you to record at 60 frames per second. As well as smoother realtime footage, you can also slow the footage down to half playback speed, and still maintain a minimum 30 FPS. For cinematic effect, you could conform it to an even slower 24FPS. Technically, the Yi4K+ was the world’s first 4K60 action camera, but was shortly joined by the GoPro Hero 6. If you want the ultra wide field of view mode, where the full 4:3 sensor is used and stretched to 16:9, you’re limited to 4K@24FPS. Gimbals attempt to counteract motion with stepper motors. 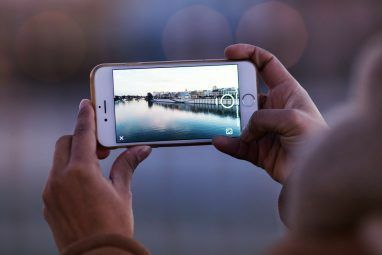 They’re one of the best kinds of stabilization you can get, though being a hardware product the cost and final quality varies from a few hundred dollars for a small selfie-stick form factor device designed for action cameras and phones, up to thousands of dollars for heavier cameras. “Steadicam” is a brand name for a what is essentially a counterweight to your device, smoothing out motion naturally. Of course, having a heavy counterweight can get kind of annoying and is completely impractical for an action camera. Optical Image Stabilization typically means a series of electromagnets that surround the lens or sensor, compensating for small amounts of motion. You’ll an OIS system inside many high end phones or expensive DSLR lenses. Electronic Image Stabilization, or EIS, is what we find on the Yi4K+. It’s not terrible, but it is arguably the least effective method of stabilization, and works by cropping the sensor on the camera hardware itself, using the cropped area as a buffer. Unfortunately, with heavy motion, you can get some unnatural “snapping” artifacts as the system re-adjusts to fit a new frame. The point is that while the EIS on the Yi4K+ is a nice feature to have and could be quite useful for vlogging style camerawork – where you just need to deal with a shaky hand – it’s not going to do much for the high paced action adventure. If you want stabilized footage without buying hardware, you’re going to crop the frame regardless. My recommendation would be to invest in some decent editing software, and skip the on-camera EIS. Just record a full frame video at 60FPS, then use the editor to tweak the amount of stabilization required. If you do want super smooth footage from the Yi4K+, consider their own gimbal. We recorded the review half with 4K30FPS EIS enabled, and half with plain 4K60FPS. If you haven’t already, watch the video to see the difference in footage smoothness and crop factor. There’s a ludicrous number of video modes available spanning 3 pages of my iPhone 6 Plus. You can go all the way down to 720p @ 240 fps if you want, or 1080p @ 120fps. As you can see, each command must be prefaced by “Yi Action”. Under the settings menu, you’ll also need to train it first by recording your voice. Record under the same conditions in which you plan to use the feature for best results. Obviously, this will not work from within a waterproof case, since the microphone will be fully covered. The only command I regularly had an issue with was Turn Off – the others seemed to work very reliably, first time. The previous Yi4K model used a microUSB port for charging and data transfer. Changing that to a USB-C on the Yi4K+ has added a couple of very cool features. The first is the ability to output to a TV. A niche use case perhaps, but still nice to have. It’s through an RCA plug only, and you’ll need to order a special cable from Yi. The second will prove to be a lot more useful I think: the ability to connect an external microphone. An adaptor cable is included in the box, so if you need to speak over your action shots or are planning to use this for vlogging, you can now use a good quality mic. (Note that you’ll need to manually select this option from the menu, the external mic doesn’t automatically activate when you plug one in). Another neat addition to the Plus model is the ability to save photos as RAW files, rather than straight JPGs. This allows you to recover and tweak the lighting. This greatly increases the time it takes to save a photo compared to just JPG, however. While the original Yi4K was capable of RAW output, it required some third party scripts to hack in support. This is now officially supported with the Yi4K+. Obviously, this isn’t unique to the Yi camera or a mark against this device – it’s just the nature of having a wide field of view. You can correct this somewhat in most editing suites. The large touch screen that covers the back of the device is – like the previous model – a joy to use. It’s responsive, and makes navigating the video modes and various settings very easy. While the device does offer Wi-Fi control, you won’t need it unless you’ve got the screen tucked away somewhere awkward, like in a waterproof case. Like the previous model, I had no issues getting the Wi-Fi to directly connect when within a reasonable distance – about 10m when outdoors, and considerably less indoors. There’s a couple of features missing from the Yi 4K+ that the GoPro Hero 6 offers. The first is an HDR photo mode. Again, you probably don’t want to take photos on an action camera anyway, and the Yi 4K+ does output RAW format, so you would be able to do some degree of HDR-type processing anyway. The second may be more important to you: the lack of a GPS sensor. In fact, GoPro devices cram a number of sensors in, and allow you overlay data from these on top of footage. If this sounds like a feature you’d like, you’ll need to pay the premium for a GoPro Hero 6, or lose the 4K 60FPS and go for the Hero 5. In practice, some have lamented how awkward the software is for doing this. Should You Buy The Yi4K+? 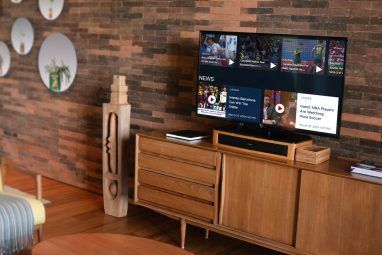 We already highly recommended the the Yi4K model, and while this is a perhaps an incremental update, they’ve certainly not made anything worse. It still represent fantastic value for money, and the ability to record at 60FPS 4K will add a lot of value to all types of users. The Electronic Image Stabilization is a nice option to have when shooting at 4K 30FPS, but there’s better software options if you’re doing some post editing, so we’d recommend just leaving it off and recording without crop at 60FPS. Explore more about: Camera Lens, Digital Camera, GoPro, Slow-Motion Video, Sports, Vlog. We foster puppies and this would be so great to take beautiful pictures to help them get adopted. Thank you for the opportunity! This will make picture better. I want it to be mine. Please let me win this. This could be my ticket for better picture. I want it so bad. It look great and tempting...So wanted to win this please!! This camera would be awesome to help me with my photography hobby.I am so grateful to have this opportunity to participate..Thank you for the chance to win! I have this camera just go for it..It is epic for beginners as well as professional photographers & videographers...Then you can further edit it to make it look more awesome .. Thanks a lot for compiling this useful list. I was looking for something like this. Will see how much I can brush up my skills using these.